If you have a toothache in Englewood OH, you may need dental treatment, and it’s always better to get it treated sooner than later. 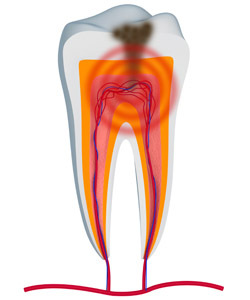 Endodontics is the Englewood, OH branch of dentistry that includes root canals. This endodontics treatment cleanses the interior of the tooth that has a toothache and replaces the infection with a sanitized tooth. Root canals in Dayton may be dreaded by some, but only because of outdated root canal dental techniques. Drs. Vitangeli provides endodontics in the Dayton area that are not much different from getting a dental crown. With modern endodontics diagnostics and anesthesia, your comfort is assured during a root canal procedure in Englewood, OH. If you do have a complex root canal case that may be difficult to numb and your toothache is causing you severe pain, our doctors will communicate this and plan accordingly for your best care. Root canals help you keep your natural tooth instead of having it extracted. The pain of a toothache infection is eliminated when you have a root canal, usually immediately after the procedure. Your short-term and long-term oral health are part of the root canals treatment process. If you do have any concerns during your root canals procedure or any other treatment, we are happy to offer dental sedation as well. We offer laughing gas and oral conscious sedation, so your level of comfort can be assured. Smile in comfort and with confidence. We are experienced endodontics dentists who care about you. Your health is in good hands with Dr. Louis and Dr. Dominic Vitangeli. We do not want you to suffer unnecessarily with a toothache in Dayton. You will find that when you are here in our comfortable office, our excellent treatment plans and amazing dental team will make you feel relaxed–like you’re with family. Call or stop by today!